Those Broken Lizard boys had quite the run. After needing to visit colleges for screenings of their debut Puddle Cruiser, the comedy troupe struck it big with Super Troopers, in effect giving them free reign to see both follow-ups have their day in multiplexes, albeit to low returns. As a result—Club Dread is admittedly weak, but Beerfest found some of that magic from their Trooper days—the new flick wasn’t given a wide release, instead relegated to DVD and the hopes word of mouth and fan base will turn it into a profit so that the next film can be made. 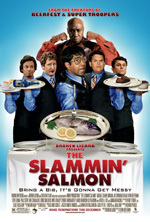 The Slammin’ Salmon could possibly be their most well-rounded movie to date as it’s fully formed and the least likely of their endeavors to feel as though it’s just a bunch of funny skits pasted together. Universal has the boys signed up to a deal that could give them the financial security they’ve been seeking from the beginning and, in all honesty, this gem has the goods to make me think it could be a promising future indeed. The major change of note this time around is that director Jay Chandrasekhar has given the reins to Kevin Heffernan. One could say that the move works because the film itself takes place in one location, but that may actually add to the difficulty. Heffernan has to maneuver his way through the restaurant tables and large cast of extras with skill and grace, even orchestrating a ballet number involving most of the main players. Unified tone is crucial since the highways, beaches, and Germany are no longer there to allow for fresh visuals when called upon. The most exotic Salmon gets is a quick sojourn to the restrooms for a quiet place to converse and monologue away from the hustle and bustle of the craziness on the floor. Because of this, you might say that Kevin had his work cut out for him, ushering in a new era for the mostly haphazard and wild quintet—one of maturity and cinematic skill. Never before have the guys appeared so comfortable, shedding the roles from the past and creating something completely new. Each work before it consisted of caricatures while, existing here too, the wait staff inhabiting The Salmon is an ensemble of kindred spirits. That is not to say the eccentricities and quirks are non-existent. Look no further than Chandrasekhar’s Nuts, a man with a nickname that describes him when he is off his meds. He may be mild-mannered square by day, but when the drugs wear off and Zonga appears, all hell breaks loose. Complete with a reality blurred sequence feeding a table of felines raw fish—recalling his great drunk fantasy in Beerfest—Nuts is the most outrageous character involved, keeping the insanity quotient high enough to let the others remain some semblance of normal. They need to keep their heads too since the whole affair pits them against the wallets of that evening’s customers. Unless they make twenty grand so that Cleon ‘Slammin’’ Salmon can pay off his debt to the Yakuza, the whole restaurant closes and they are on the streets looking for new jobs. The staff may not know this little wrinkle, but they do know that if they work harder than they ever have, the highest grossing employee will take home a cool ten grand him or herself. For an out-of-work actor who just got fired from a hit tv show, two girls paying for dance and medical school respectively, a guy who could be committed, and another that hallucinates he’s the biggest ladies’ man alive, that cash is king. Glengarry Glen Ross this is not, however. Instead of the low man losing his job, the one with the least amount of earnings gets a ‘rib sandwich’ from the ex-heavyweight champ and titular Salmon proprietor, played by the formidable Michael Clarke Duncan. This guy gives the best ‘star’ cameo performance since Brian Cox started the trend; his hot-tempered, foulmouthed bully is precise in his aggression and complete lack of knowledge in the ways of the English language and popular phrases. Why need to pronounce a word when you can just tell the mofo correcting you that you’ll shove something nearby up his behind if he doesn’t shut up? The dude instills a sense of fear in each employee, but most especially in his manager Rich, played by Heffernan. A waiter himself in the short preface setting the stage for the night in question, his ascension is left in the dark until later on, but his lack of spine exists straight on through. Preying on his staff’s weaknesses and greed, his actions towards filling that register lead to a series of unfortunate events for each person out on the floor—thankfully their misery is our fodder for nonstop laughter. Paul Soter portrays twin employees, one a disgruntled cook and the other a naïve busboy; Erik Stolhanske is the big-haired Mr. Cool doing what’s necessary to haul in the cash; and Steve Lemme is the ex-pat that has returned after a starring television role opposite Morgan Fairchild, (who appears as herself beside a great Lance Henriksen), the pretty boy looking to use his charm to win over his customers. While the boys are great, their roles are nothing without the interactions of an all-star comedic cast. So many Broken Lizard regulars make appearances, but it is by far Will Forte who rules them all with a wonderful payoff at the completion of his arc, putting him miles in front of second place’s Sendhil Ramamurthy who’s credits outtake could elicit the biggest laugh if you’re a fan. Add in leading turns from comic beauties Cobie Smulders, (“How I Met Your Mother”), and ex-“Two and a Half Men” actress April Bowlby and you’re doing pretty darn well. Everyone is game for some physical gags as well as witty banter, upping the ante as far as freak incidents go in the restaurant setting, placing The Slammin’ Salmon far above films like Waiting… that stick too close to the common myths of what goes on behind those swinging doors. Definitely see it if you’re a fan and tell all your friends so that the troupe can continue to make gems. Heck, you’ll even get a wonderful “Eye of the Tiger” send-up in “Cry of the Cougar” … I need to get that on my iPod for sure. 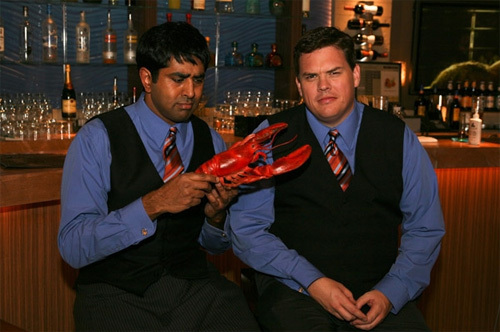 Jay Chandrasekhar as Nuts and Kevin Heffernan as Rich Ferente in The Slammin’ Salmon.